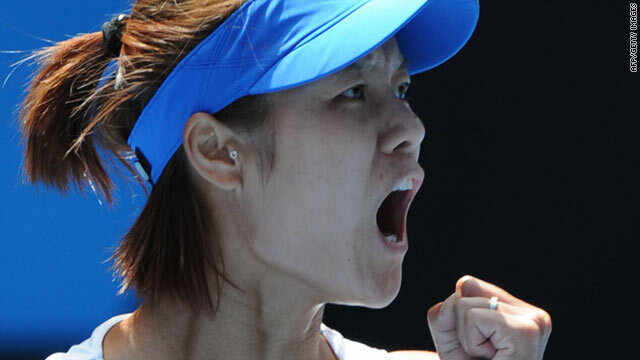 Li Na rallied from a set and 2-4 down to upset sixth seed Venus Williams and reach the semifinals in Melbourne. (CNN) -- China's Li Na rallied from a set down to stun sixth Venus Williams and reach the semifinals of the Australian Open. Li recovered from the loss of the opening set to go through 2-6 7-6 7-5 in a nail-biting match that lasted two hours 47 minutes and saw the American's serve broken eight times. By defeating Williams -- who has never won at Melbourne Park -- 16th-seed Li joined countrywoman Zheng Jie in becoming the first time two women from China had reached the semifinals of a grand slam tennis tournament. "Venus played aggressive in the first set. She didn't miss a lot balls. I was feeling more pressure in the first set," Li told the tournament's official Web site. "Then (in the) second set I was feeling a little bit better, but still was like 5-3 down. Then I just tried to play more balls back." Li will now face Venus' younger sister, defending champion Serena Williams, for a place in this weekend;s final. I'm just happy to still be here. You guys really helped me out today. Top seed Serena, who played with heavy strapping on her on-going thigh injury, also rallied from going a set down to defeat seventh seed Victoria Azarenka of Belarus 4-6 7-6 6-2. "I'm just happy to still be here," Serena told the official Web site. "You guys really helped me out today," she added, acknowledging the fans in Melbourne. In the other women's semifinal, Zheng -- who also reached the Wimbledon semifinals in 2008 -- will face Belgium's Justine Henin. The unseeded Henin is attempting to emulate compatriot Kim Clijsters -- the U.S. Open champion -- in winning a grand slam event immediately after coming out of retirement.